Hi @zagigirl, MANY THANKS! I can send you 1pc by mail, just give me your address! So great to see you around on this thread! We really miss this drama!! but BM was really challanging and different , sadly it didn't capture fans attention . MaysoonD said: @zagigirl‌ Hotel king have a special place in mye heart too but BM was really challanging and different , sadly it didn't capture fans attention . 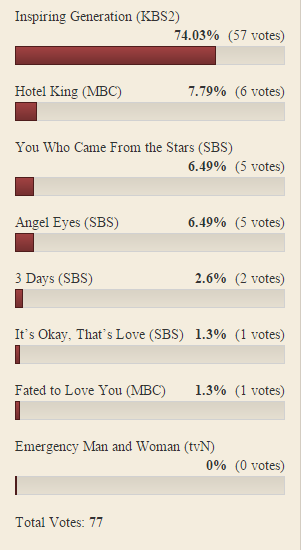 Hoteliers, don't forget to vote for Chamo and LDW on MBC Awards 2014!! I feel happy to see our main couple in "My Girl" can become a couple again in this drama..
Hotel King is a very interesting drama..
you can vote once every six hours until February 17, 11:59 PM KST! please remember to cast your vote! !